April didn’t have many good days for my local spots, but I did manage to get a photo that I’ve been after for a while. I’ve always been fascinated with photos that are looking out of a tube. When I started reading surf magazines and watching surf films they were pretty rare. With digital cameras, in particular GoPros, they’ve become much easier to take for anyone who’s willing to swim around in hollow waves. Some of my favourite photos over the last few years have been this angle. One day I’ll put together a post about the evolution of this style of photo, my own efforts, and the professionals. I’ve shot this kind of image with Digital 8 camcorders, mini DV camcorders, phones, point and shoot cameras, DSLRs, GoPros, 360 cameras and mirrorless cameras. The Sony a6000 combined with a small surf housing and an inexpensive manual focus fisheye lens is by far the best setup I’ve used for this type of photo. This one from April is my favourite yet. 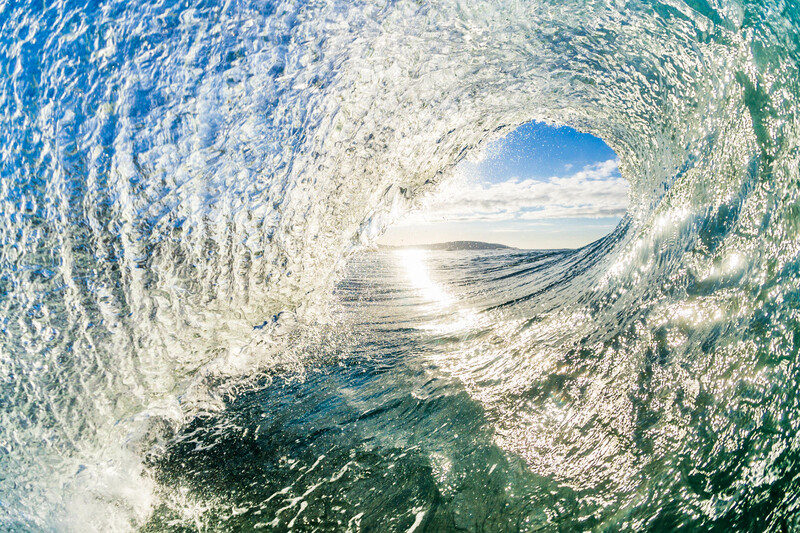 The texture of the wave and the lip make the low morning light sparkle all over the image, and the positioning in the barrel is exactly right for mind surfing. The final image shows the lip connecting with the face of the wave and offers a clear view out of the barrel showing a distant headland. There’s another photo in this 2017 round up that was taken with the Meike 6.5mm fisheye, so I’ll go into a few more details about the processing when Iwrite about that one.